We arrived on our site above Brothers Volcano more than a week ago and started drilling operations as soon as JOIDES Resolution came to a halt. And yet only today, we are getting into serious rock! 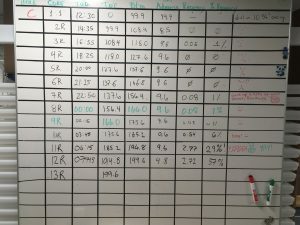 The figure shows our logboard, maintained by the ships science technician who faithfully record the recovery of each core that is brought on deck. Every core advances a few meters into the seafloor. sometimes up to 9 m, sometimes less. The second column to the right shows our recovery which is the percentage of rock recovered per total advance. Only in core numbers 11R and 12R the percentages of drilled rock finally rise … 29%…. 57%….these are several feet of rock rock with a diameter of 6 cm ……..and hopefully the percentages keep rising as we are now drilling near 200 meters below the seafloor. The numbers above that depth are just dismal — zilch, and zilch and more zilch, and a 1%, which is a essentially courtsey number, given the tiny pebble that came up! Why is this so difficult? This is because the upper layers of volcanic rock on the volcano are loosely packed ‘rock rubble’ – the drilling corer catches that very badly, and most of the material is just destroyed and washed out and lost before it can be pulled back on board. But as we get deeper the rocks is harder and backed together. We have still 200 meters more to go until our target depth of 400 meters…without technical snafus (touch wood!) and more rock the science story will unfold.